“In Donis Casey’s skilled hands, Alafair Tucker and her family once more come to life. Casey excels in relating the day-to-day details of their lives. In this case, it’s the details of how a community quarantined itself, shutting schools and churches and businesses. There are all the details as Alafair nurses the sick, including the details of the country remedies. The book mentions the reluctance of morticians to handle the dead, the fear that people had as so many died. Yet, in the midst of war and the flu, there was still murder. And, Alafair Tucker, with her deep understanding of people, and her motherly skill of listening closely to people, finally discovers the killer at the Thomasons’. The Return of the Raven Mocker is a successful story of Oklahoma life in the early twentieth century, and murder, as only Donis Casey can write it.” Lesa Holstine, Lesa’s Book Critiques. “Alafair Tucker and her brood live in a very small town in Boynton, Oklahoma. The year is 1918. WWI is off across the pond.. but, the Spanish flu pandemic of 1918 is smack dab in the back country. The United States is on the cusp of huge changes. From horse and buggy to motorized bikes and side cars. Outhouses versus indoor plumbing. In this little town.. the lives of all are disrupted when the Red Cross advises all to prepare for one of the worst pandemics to hit the country since the Russian flu of 1880. I have never read any of the Alafair Tucker stories. I didn’t even realize they were part of an on-going series until after.. when I went to seek other books the author had written. This book is very much a stand alone! The characters are so endearing to the reader. It makes you want to be part of this loving brood. Brother and sisters who would do anything for a loved one who truly is in need. My grandfather had told me stories of the great Spanish flu and I’ve always been interested in it since then. The author depicts much of what occurred during this time to the families who survived. And, those that did not. Entire families were taken within days of one another. To be buried in mass graves, with or without coffins. Embalmers refused to embalm the bodies for fear of catching the flu and dying. I truly enjoyed how the author so easily transitioned the major changes in technology that were taking place in 1918. I had not thought about how medicine was changing as well. The doctor in the story is sent to Boynton, Oklahoma to assist as he had a gimpy leg and could not serve in the military. He insists on cleanliness and taking extremes to quarantine patients from the healthy members of the community. He scoffs at the old fashioned remedies that he witnesses being used on very ill patients. Insisting that some of the “cures” are actually the cause of death. 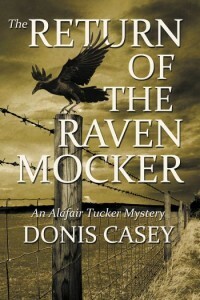 “The Return of the Raven Mocker is the ninth Alafair Tucker mystery by author Donis Casey. I have read the previous books in the Alafair Tucker series and found them all to be fascinating, well written and informative. The Return of the Raven Mocker. The title of the book itself is enough to grab anyone’s attentions. How intriguing can you get? The Raven Mocker is an evil bigfoot being from Cherokee mythology who robs the old, sick and dying of their lives. As the Spanish Flu Epidemic of 1918 barrels through Boynton, Alafair is reminded of the Cherokee myth and doesn’t even want to hear the name Raven Mocker. I love the characters that author Casey has created in Alafair’s family and the town of Boynton. Alafair’s large family is fighting World War I in Europe and the Spanish Flu at home. Opening The Return of the Raven Mocker, the reader is transported immediately into the realm of the Tucker farm and their lives. It is always a fascinating world to dive back into. 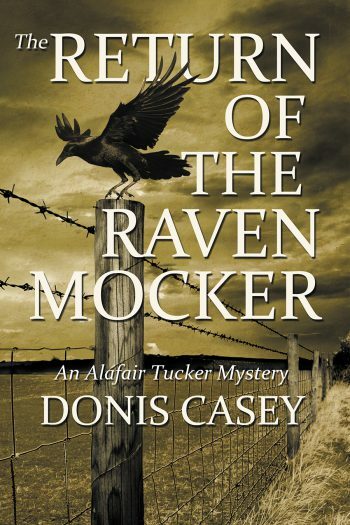 I will always– always– enjoy an Alafair Tucker novel written by the talented Donis Casey, and I did enjoy The Return of the Raven Mocker, but it’s not the strongest book in this wonderful series. It is more historical fiction than historical mystery, with Casey doing a powerhouse job of showing the effects of the flu pandemic in Boynton, Oklahoma. For instance, despite people’s best efforts to quarantine the entire town, people were so desperate for news from their men fighting overseas that they were willing to risk infection and even death just to get the mail. While she is tending the stricken, World War I is nearing its end. Not soon enough for Alafair and her brood. When next-door neighbors seem to have lost a father [sic] and daughter [sic], Alafair is sure that the flu did not take them. She has been known to insert herself into investigations best left to the law. I have enjoyed this series very much. On opening the first page, I feel myself being pulled into the Tucker family – happily so. Author Casey has depicted the care she gave to her stricken family – which seems to me to be close to what I had been told saved my mother’s twin brother when he contacted this horrifying disease.